-Stir sugar into espresso. Cool mixture. -Stir milk and pectin into espresso mixture until pectin is dissolved. -Fill a glass with ice and either serve mixture over ice, or pour glass contents into blender and blend for 30-45 seconds. Starbucks Frappuccino Mocha: + 1 pinch cocoa powder. Starbucks Frappuccino Chocolate Brownie: + 1 pinch cocoa powder and 2 Tbls. chocolate chips. Starbucks Frappuccino Orange Mocha: + 1 pinch cocoa powder and 2 Tbls. orange chocolate chips. 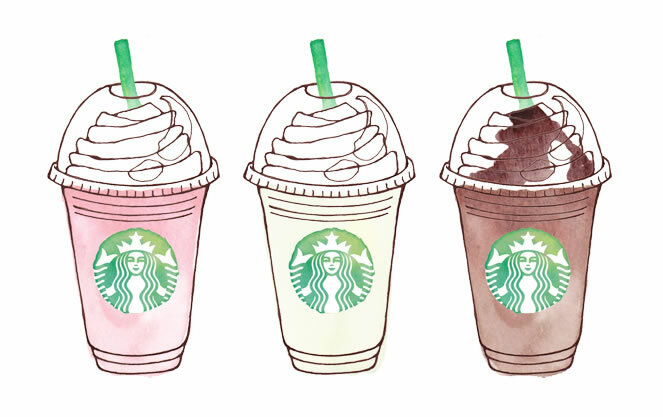 Starbucks Frappuccino Rumbuh: + 2 Tbls. crushed chocolate cookies. What do I use for the mint flavor–just mint extract? Thanks for posting; now I can satisfy my craving for the discontinued Chocolate Brownie frap! I am so excited to try these recipes! Where can you buy pectin & arrowroot? you can buy arrow root and pectin in the baking isle of any grocery store. Why is pectin necessary in this recipe? Previous Previous post: Wanna buy some shares? What about SBUX?